California’s drought has sent researchers, policymakers, and farmers looking for water in farfetched places. They’re giving away recycled wastewater. They’ve pumped deeper and deeper underground. They’ve even refined a technique to try to squeeze rain out of the clouds. But what if they could harness the power of tiny mosses that can survive for decades without a single drop of water? Such mosses do exist and many of them are hidden in plain sight in California. 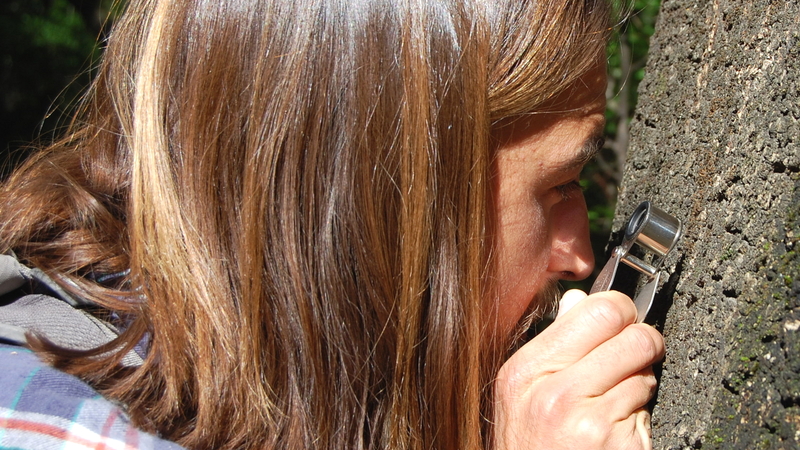 Biologist Caleb Caswell-Levy, a doctoral student at the University of California, Berkeley, carries a small hand lens as he walks among the trees in Strawberry Canyon, near campus. Every so often, he leans his lens –which looks like a monocle– against a tree and examines a brownish, dried-up clump stuck to its bark. He spritzes some water on a clump and in seconds its leaves, curled up like a corkscrew, unfurl. A look under the microscope reveals bright green leaves arranged as a tiny star. 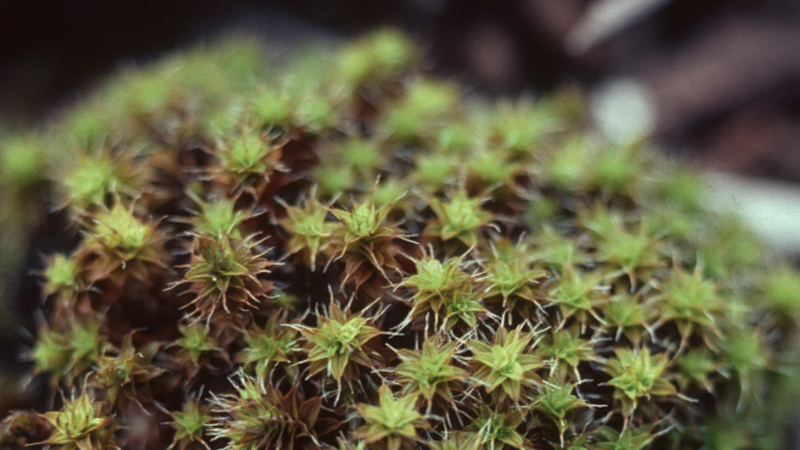 It’s a moss belonging to a group called Tortula. 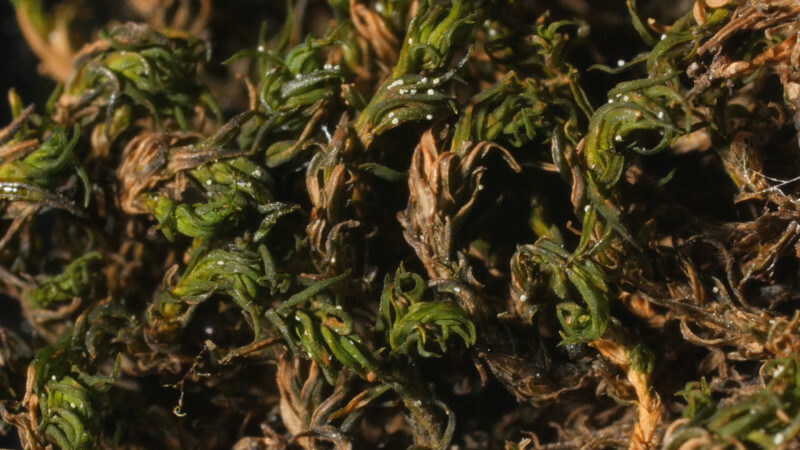 (You can watch Tortula mosses unfurl at 0:49 and 1:09 in the video above). These mosses’ unique ability to survive months, or even years, without water and then spring back to life when it rains has led scientists at UC Berkeley and around the country to study them carefully. Researchers call them “resurrection plants.” They hope to use their genes to create crops that could survive dry periods, like California’s current historic drought, with minimal water. 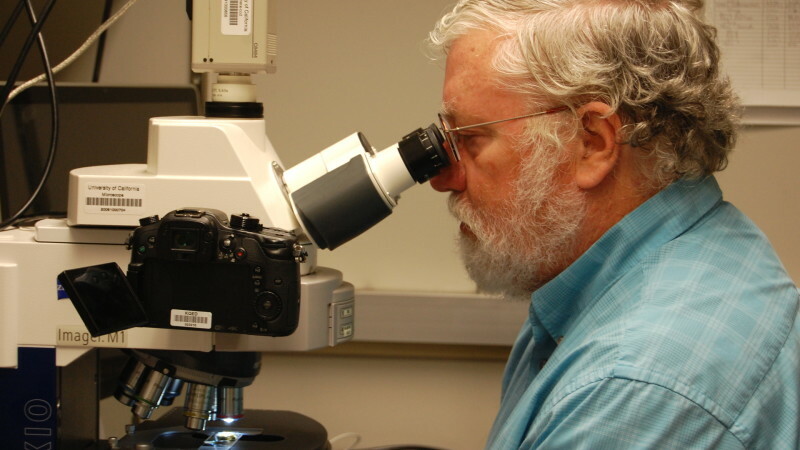 These mosses dry out so completely that it’s as if they had been placed in an oven, said Brent Mishler, who directs the University and Jepson Herbaria at UC Berkeley and the lab where Caswell-Levy studies. When there’s no rain, Tortula mosses dry out completely and stop photosynthesizing. That is, they stop using carbon dioxide and the light of the sun to grow. They’re virtually dead, reduced to a pile of chemicals, and can stay that way for years. Researchers have found dry, 100-year-old moss samples in a museum that came back to life when water was added. These mosses are very good at repairing their damaged cells, and that’s a skill that would serve crops well, experts say. Right before they dry out, the mosses write themselves a set of genetic instructions, so that if they ever get water again they can start growing right away. Their ability to prepare themselves beforehand and repair themselves after a dry spell reminds Mishler of what humans do to prepare for natural disasters. 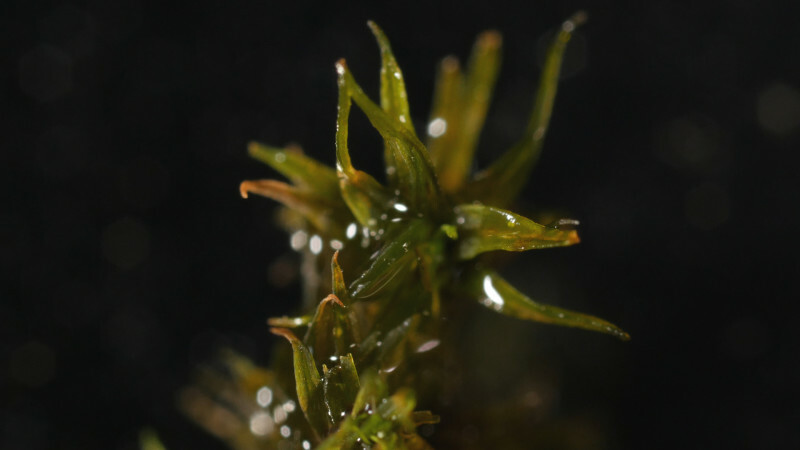 Mel Oliver, a research geneticist with the U.S. Department of Agriculture and the University of Missouri, Columbia, has identified close to 80 genes from Tortula that allow the mosses to write genetic instructions and repair themselves. He calls these genes rehydrins. 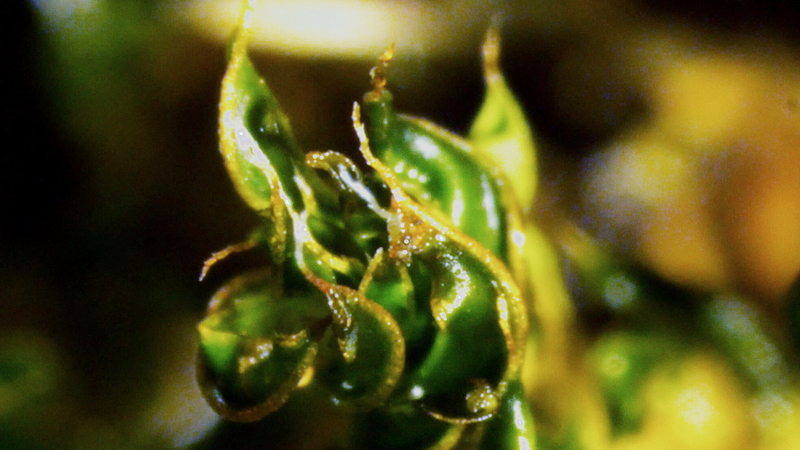 Researchers have looked inside the crops themselves to see if they don’t already contain some of these moss genes, left over from 450 million years ago, when a common ancestor of mosses and crop plants moved onto land and acquired the ability to live without water. "By studying how the moss handles losing water and how it repairs damage, if we can understand those processes, we can look at new ways to improve drought tolerance in crops." But using moss genes to make crop plants better able to survive dry spells is a big challenge, in part because this ability comes not from a single gene, but likely from a group of genes, said Mishler. Another challenge is balancing drought-protection with the need for high yield. It turns out that there really is no free lunch: mosses’ useful ability to live without water makes it hard for them to grow very big. The cellular mechanism that a plant needs in order to live without water slows down its productivity, measured by the amount of new green tissue a plant can grow. That’s why many plants shed their ability to live without water in favor of an increased ability to grow big. Plants that can hold water inside their bodies are able to grow big. So if you try to make a crop plant more like a moss its yield will decrease. That’s why researchers’ goal isn’t to make a crop that can live entirely without water, like a moss, but rather a plant that could repair itself after a dry period, even if some yield were lost in the process, said Oliver.